The Samsung planned to launch the world’s new operating system called Tizen powered the new Samsung smart phones such as the Samsung Gear 2 and Gear 2 Neo. The Samsung powered its smart phones and tablets by Google android Operating system until now, but the Korean confirmed its wish to go alone with unique, so Tizen Operating system is created. The Tizen operating system is impressive and so unique when compared to other operating systems. So read the review and get an in-depth view of the Tizen OS. The Tizen Operating system is the Linux based OS, Which is the open source platform. The Open source platform means the main features of the Tizen is compatible with the other mobile platforms, where the applications created with the Tizen OS compatible in other operating systems such as IOS and Android. The Tizen operating system is a HTML based OS, which is written on the HTML5 coder. The HTML 5 allows the split screen multi-tasking and best support for video. You don’t have such a longer download to watch the YouTube clips. The Tizen looks similar to the android with Touch Wiz, which supports integrated power saving, multitasking and much more. In Tizen you can swipe the down notification bar used in the Touch Wiz UI with the toggle bar. The Tizen is power by the ARM x86 processor, which have many personalization capabilities even than the android. 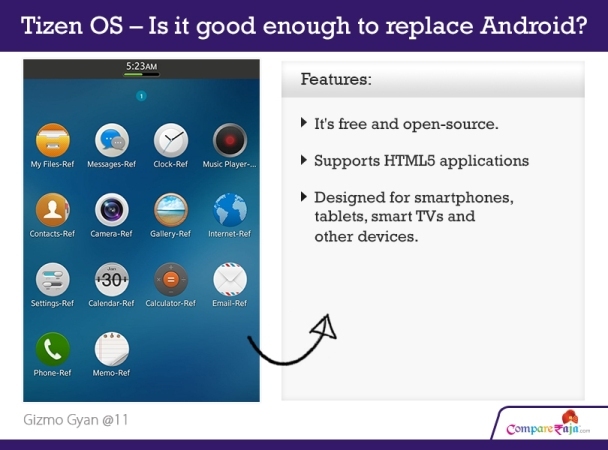 So Tizen will be the best Operating system and also compatible with the other. If you want to experience the world’s new operating system, you must buy the Samsung Z smart phone. The Samsung Z smart phones working under the back bone of powerful Tizen operating system. The new version of Tizen will be hit the market with big bang in future.